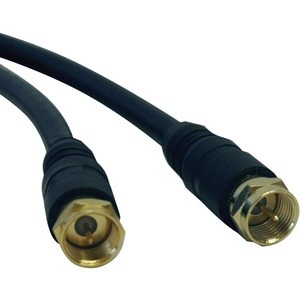 Tripp Lites RG59 Coax F-Type cables are constructed of double-shielded, 23 gauge, 75ohm Coax cable, and are used in video applications such as Cable, Satellite, and any peripherals with Coax F type threaded connections. 24K Gold plated connectors and fully molded ends ensure long life reliability and crystal clear video . Tripp Lite Lifetime Warranty.